This has to be one of the most striking Pagani Huayras yet. The Pagani Zonda spawned a slew of special one-off models commissioned for some particularly wealthy clients that kept the Italian supercar in production far longer than anyone expected. The latest bespoke Zonda was the built to celebrate company founder Horacio Pagani’s 60th birthday, which seems like a fitting send-off. 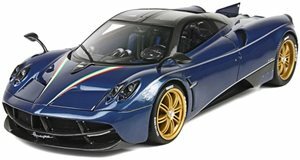 Its successor, the Pagani Huayra, has also been given the bespoke treatment, with examples including the which adopts design elements from the Zonda R.
Just as lavish is the Huayra Americano, which is currently up for sale at the official , California. Setting the Huayra Americano apart from standard models are a series of unique design touches that make this one of the most striking Huayras yet. It was delivered to its original US owner in the second half of 2016 and is fitted with Pagani’s Tempesta aerodynamics package available for the Huayra. The exterior is coated with a combination of silver components and gloss carbon fiber body panels accented with a red stripe running down the center, creating an eye-catching finish. It also features red brake calipers and black multi-spoke wheels. Unsurprisingly, the Huayra Americano’s interior is just as striking, featuring black and red leather seats and copious amounts of carbon fiber everywhere you look, complemented with black aluminium accents. A plaque inside reveals that this is number 68 out of the 100 Huayra coupes planned for production. Being based on the standard Huayra coupe, the one-off Americano presumably packs the same 6.0-liter Mercedes-AMG engine that produces 720 horsepower and 738 lb-ft of torque. No price has been listed, but the owner will no doubt have paid a lot more than the standard car’s original $1,424,966 base price.